Staff Sgt. 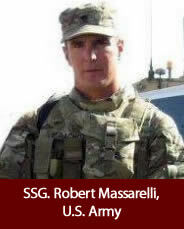 Robert Massarelli, U.S. Army, age 32, of Hamilton, Ohio, died June 24, 2012, in Kandahar, Afghanistan. He was assigned to the 180th Transportation Battalion, 4th Sustainment Brigade, 13th Sustainment Command (Expeditionary), Fort Hood, Texas.